John Bellany grew up in the seaside town of Port Seton, and the sea and the special light effects of a seaside environment affected all of his work. So too did Bellany’s experience of life in a small provincial community with a powerful but claustrophobic religious culture. His painting is strongly autobiographical and narrative with strong, though often symbolic references to the forces that dominated his life. 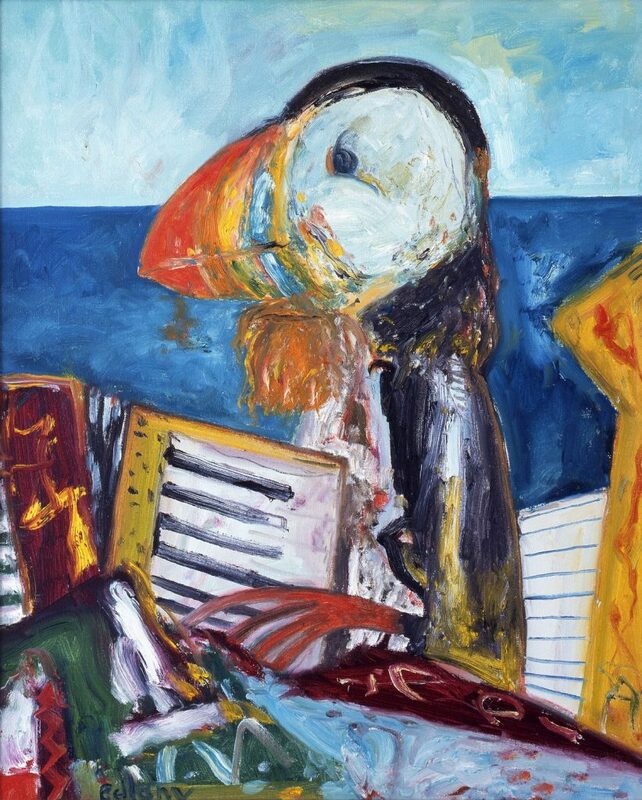 The adoption of the puffin as an alter ego in ‘Self Portrait’ is perfectly in keeping with his search for archetypes that link his personal history with more universal human stories.The use of the profile silhouettes the bird/artist between the sea and the viewer, firmly establishing the artist’s role as go-between yet also reinforcing his isolation and separation.